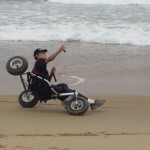 I first had the pleasure of meeting Christoph at the Berkeley Kite Festival in 2003… 14 at the time, he was switching back and forth etween his buggy and land board, handling the big Berkeley winds with ease. While he’s not a particularly outspoken individual, his style and big air jumps had people entranced throughout the weekend! He is one of those kite fliers who truly believes in promoting the various types of kiting throughout the industry, and is not restricted to traction kiting alone. 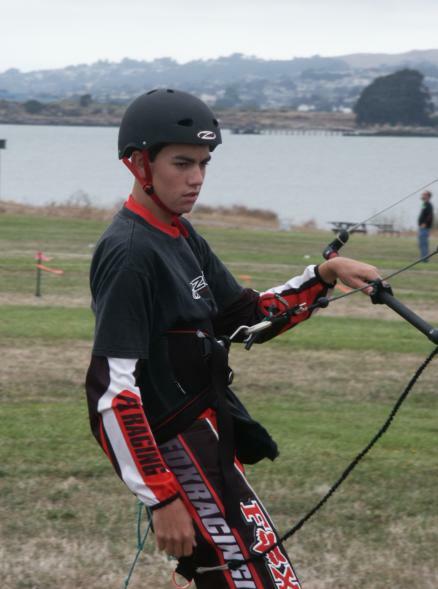 While not yet on the competition circuit, we can no doubt look forward to great things from this young man as he grows in the sport… He and the whole Windzup team have been working hard to promote kiting all around! When did you start flying, and what initiated it? In 1998, when I was 9, I got a cheap dual line stunt kite for my birthday. I flew that for a few months and eventually lost interest. About two years later I remembered how much fun that kite had been and tried to find it. To my dismay it had gone out with the trash a while back. Determined to get myself another kite to fly, I went on the internet and searched for “kites”. I ended up purchasing a beginner dual line, the Prism Fanatic. 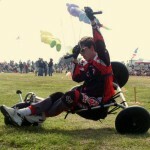 After flying the Fanatic for a while, I met David Sabilino, a nationally recognized kite buggier. He showed me a variety of different types of kites and let me try to fly them. Once I had seen the skill with which he could control a kite I knew I was hooked… I had always thought extreme sports like Motocross were awesome, but they never seemed accessible. 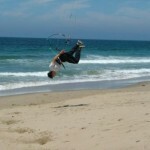 I saw kiting as a way to access the world of extreme sports without the extreme danger and expense. I was born in Nuremberg , Germany, but my family moved to Pacific Grove, California before my first birthday. My main inspiration for getting into landboarding was watching footage of pro kiteboarders like Martin Vari. I was amazed when I saw footage of him doing a handle pass more than 30 feet in the air. 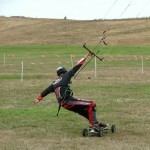 After seeing that my goal has become to replicate those kiteboarding maneuvers on land. 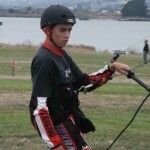 I have to thank Adam Caudill at Madkiting.com for sponsoring me and making it easier for me to get gear… I also feel grateful to my parents for being so supportive by transporting me to festivals and events and helping me pursue my dreams. 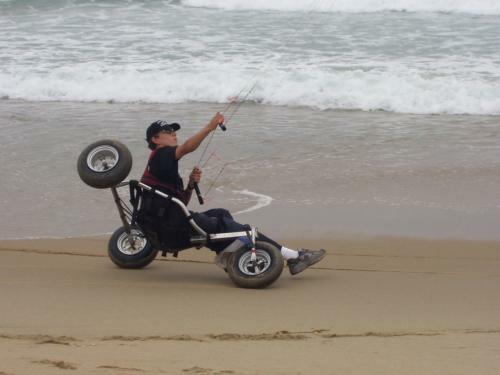 What do you look for when selecting your kites, boards, and buggies? 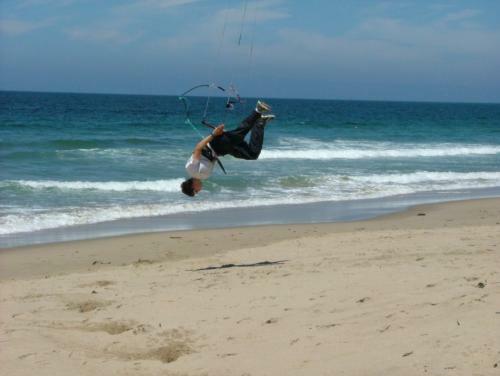 There are numerous aspects of every piece of kiting equipment that affect its desirability. I typically try to find an opportunity to test the equipment in question. Probably the two most important things to look for are reliability and predictability. You want something, be it a kite, board or buggy, which will last a long time without the need to replace bent bolts or snapped bridles. You also want something with predictable behavior. You don’t want a kite that will collapse easily or a board that wobbles. Do you compete in traction events, and how do they score competitors? I have not yet had the opportunity to compete thanks to the rain at this year’s Spring Break Buggy Blast. That was the first event where I was planning to compete. 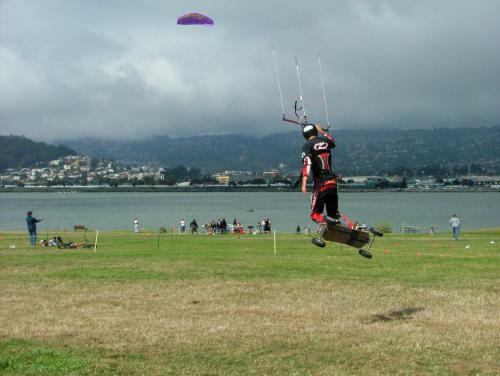 It is also the only event in the USA that I’m aware of with a kite landboarding competition. Competition usually takes place somewhat like this: each rider gets three three minute runs during which they do all the tricks they can. The riders are then judged based on overall impression. There are just too many different tricks to apply a numeric value to each move. Do you have certain tricks or moves that make the difference? I don’t have any particular schedule. I try to ride every weekend during the school year and as often as possible during the summer. When I ride, I usually have some new move that I’m trying to master. I just keep working on it until I get it. If I don’t have anything particular to practice I’ll just ride until I think up something crazy to try, like looping my kite during a jump. I also have a rope in my backyard which I hung from a tree. I’m able to use it to practice most tricks. It’s great for learning how to position your board when you are landing because you don’t end up on your face if you mess it up. How do you deal with extreme wind conditions, high or low? Both extremes are all about kite control. In high winds I try to turn the kite really slowly to keep from generating more power than I want. It’s also easier to keep my speed low if I keep my kite close to the ground and edge against the kite really hard with my board. For safety I have started using a kite leash which I attach to the back of my harness (to allow handle passes). The other end of the leash attaches to the back lines of my kite so that when I drop the bar the kite is completely depowered. In light winds you have to be very aware of what your kite is doing at all times. If the winds are so light that your kite would collapse easily you should try to stay moving at all times. What are your philosophies on the mental aspect of power kiting? I’m a serious student in a tough academic high school. Traction kiting is a release from the stresses of school. It’s a great way for me to get outdoors and clear my head. It’s an opportunity for me to be in the moment with nothing to think about but kiting. As much as I enjoy learning new tricks and improving my skills, the main reason I’m out there is for the sheer joy of it. Have you ever reviewed your style on video, and how has it been useful? I have some footage from Berkeley , but it hasn’t really helped me because it only covers tricks that I’ve been able to do for a while now. If I had footage of myself trying a new move however, I think it would be a useful learning tool. There are many things that different countries disagree on, but sports seem to be something which can unify people of differing beliefs. The desire to have fun is shared universally. 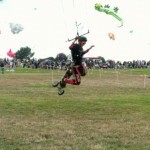 I hope to see the day when some form of kiting is an Olympic event. But kiting is not just limited to being a sport. It is also a unique art form which provides another means of unification. The potential is there to use the wind as an effective power source. It’s possible that some of the knowledge gained from kite design could be used to help design a clean and ecologically sound power source. 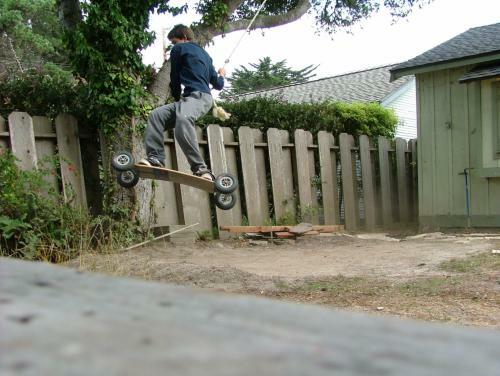 When I landboard, buggy, or kiteboard I feel as though I can go anywhere almost effortlessly. It’s complete freedom. I like the fact that I can achieve that freedom using completely natural forces, without having to fill up a gas tank. 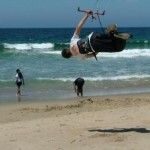 For those of us at Seaside Beach , we don’t make the trip to the beach with the goal of flying. I know that we have no control over the weather. I go just to hang out and talk with my friends. And if there happens to be wind, well, that’s just an added bonus. If somehow there were no more wind at all, I would still be friends with all the great people I’ve met through kiting. Do you see any differences in the way festivals are done in the USA, compared to other countries? 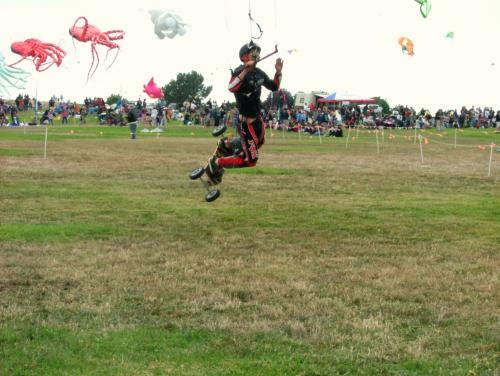 I have never been to a festival outside of the USA so I can’t say that I’ve seen differences, but the USA has a very limited number of traction kiting events. 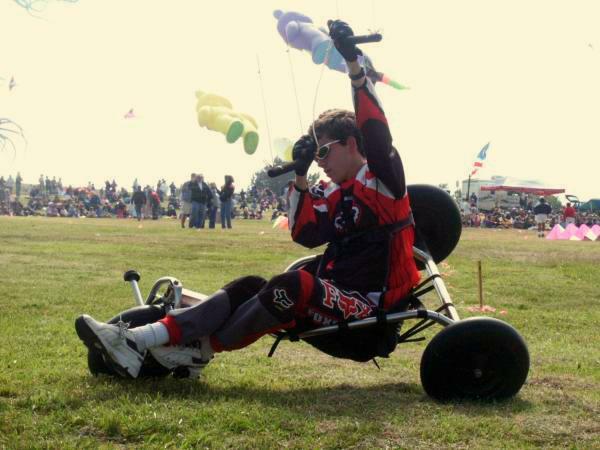 There are a reasonable number of buggying events, but I don’t know of any events in the US where the focus is landboarding. There are only three or four kiteboarding events in the US and no PKRA tour (kiteboarding world tour) stops here. I think that severely limits US riders who can’t travel all over the world to compete. Do you fly non-traction kites, and which ones? I fly most other types of kites including dual lines, ultra lights, Revs, and a few one liners. 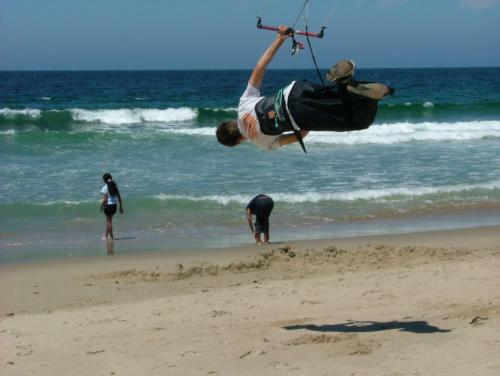 Nearly all the skills used in non-traction kites apply to traction kites. I’ve seen many riders, especially in kite surfing, who have never flown any other type of kite and It’s amazing how limited their kite skills are compared to someone who flys other kites. You learn a certain precision and finesse with a trick kite that you can’t learn just by flying power kites. If you become good at flying an ultralight, for example, you gain a much better understanding of how a kite reacts in light winds. This makes it much easier to keep a big kite going in light conditions. 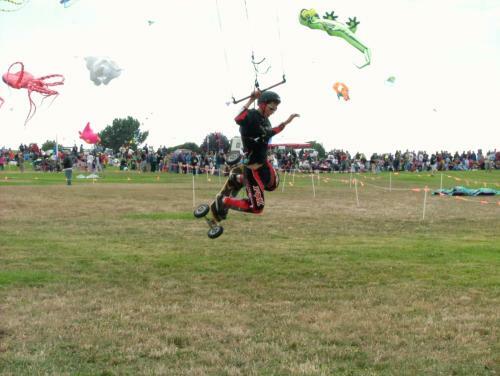 What do you enjoy the most about the idea of traction kiting competition? Again, I’ve never competed, but I’ve participated in events with other riders. I enjoy riding with people I’ve never ridden with before because it allows me to see many different styles of riding and helps me decide what I want to try next. I would like to compete, simply because it’s great to ride with other people. But, I want to try to keep my focus off competition. You have to remember why you’re out there in the first place. I would love to win competitions, but when it all comes down to it; it’s really about riding and having fun. I don’t ever want to forget that. 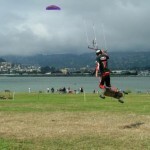 Do you have any recommendations to someone who is considering traction kiting? If at all possible, take a lesson, especially with kiteboarding. If that’s not an option try to find another rider in your area who can give you tips as you progress. You might also check out some internet forums for advice. 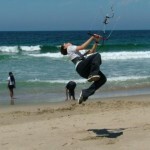 I have found the forum at gwtw-kites.com to be excellent for all types of kiting. Also, please wear your pads and helmet. The lakebed at Spring Break Buggy Blast has left permanent marks on my elbows. I’ll be getting some Motocross body armor for next year and I’m pretty experienced. If you’re just learning consider pads mandatory on any surface. Don’t think that the kite will always keep you from landing hard. How does someone go about soliciting kite sponsors? It’s a matter of getting your name out there. Last year I started going to events like SBBB and Berkeley. The goal is for the organizers of events and other important people to think of you when they want a demo of whatever you do. Then you start to get invited to events. Eventually your name gets out to the right people. 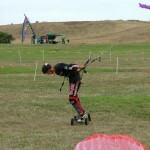 Shortly after an event in Paso Robles I got a call from Adam Caudill, owner of Madkiting.com. I discovered that he wanted to sponsor me and give me wholesale prices on kites and gear. This has been extremely helpful because as a 15 year old, I don’t have much money to spend on gear. Adam has also been super helpful in helping me get to events. I just got back from the Seaside Oregon Buggy Blast in Seaside, OR where Adam provided a place for me to stay. 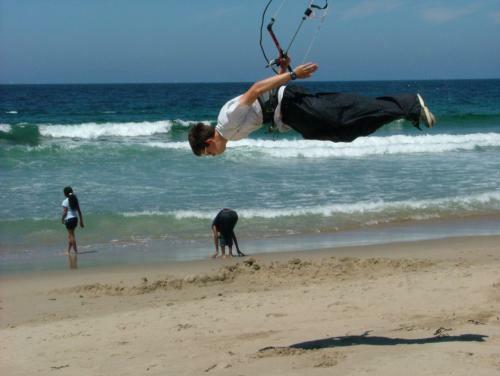 Kiting is becoming mainstream, just look at kiteboarding. It’s certainly not mainstream everywhere, but somewhere like Hawaii , most people are familiar with, or have seen kiteboarding. But kiteboarding can’t be mainstream in inland areas, or places with really light wind. That’s where we need to look to the other facets of kiting. I don’t know if trick kiting alone will ever be appealing enough to the general public to make it mainstream. I think we need to avoid separating the different aspects of kiting and instead introduce it as a whole. That’s one problem with kiteboarding. 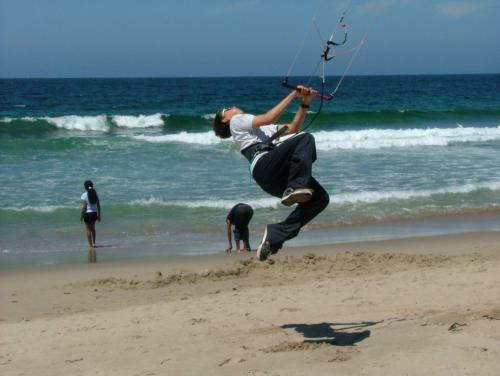 Most kiteboarders don’t know or care about buggying or trick kites. If we can increase awareness about the other aspects of kiting then we can create more opportunities for kiting to take place and for the sport to be promoted. 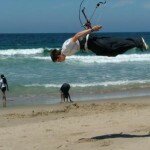 People are naturally attracted to the beauty, grace, and athleticism of kiting. Kite festivals at large public parks (like Berkeley) are a great way to introduce the sport to the general public and to give people a chance to try it out. Something like a mainstream documentary is what we need to really bring kiting into the public eye. Finally, I think all kiters have a responsibility to be good representatives of the sport. Showing consideration for the people with whom we share beaches and parks, and patiently answering questions of curious observers can go a long way to promote the sport. We appreciate you taking the time out of your travel schedule to share with us, and we look forward to watching you grow in the sport! Thank you for this opportunity. The sky’s the limit! This entry was posted in 2004, General Topics, Issue 38 (Sep/Oct), KL Archive and tagged cristoph riddle, interview, power kites. 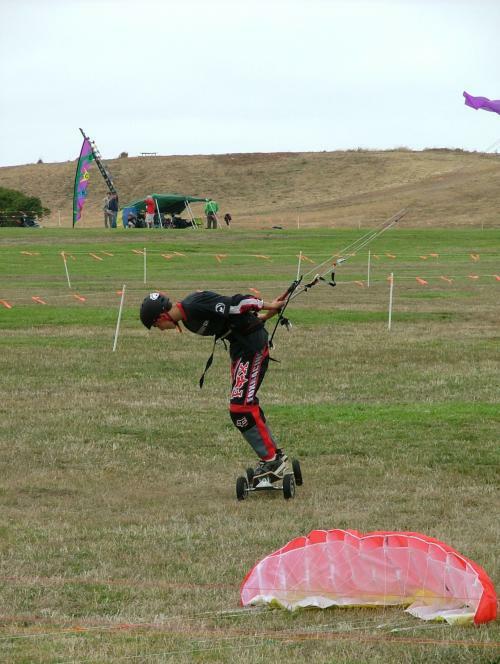 Issue 38: Bruce Lambert’s Tips – Adjusting a fighter kite for optimum performance!